I always giggle when I read your posts No I'm not buying this one. I just threw it out there hoping someone else would buy it and post pictures. I have a little sleepy pink sapphire I don't know what to do with. I don't even know what color to call it. I'm thinking a recut would bring out some sparkle? What a pretty color. How did I not know about this? Are you keeping things from me Suzanne? I'd love to see some more pics of that guy. What size is it btw? Interesting! I do see two distinct bands of colour there, and I like that the cut displays them simultaneously. Those are stunning, you should totally go for it . I think it may partially be just me. Too much time spent trying to avoid brown in warm coloured stones and grey in cool coloured stones. Now the brown just screams at me the moment I see a warm coloured stone, it is the first and strongest impression I get of a stone. I guess I must see it almost to the exclusion of all else . Sunstorm, marionberry and MissyBeaucoup like this. I'm sitting in my car laughing! You know I would never hide anything from you! It's very pretty...and larger than I was expecting. You should post some pics in the catch all thread so I can ogle them. someone needs to save my from myself: Aqua center and 2 spinel sides. Only in the $300s total, but I am on a buying hold until I finalize the red CS/CBI purchases. And before I buy anything new I HAVE TO SET SOME STONES! But these are just so gorgeous and tempting. grrrrr. mellowyellowgirl, caf, stonewell and 3 others like this. Oooh pretty! where is this? FB seller is "Fawaz AK", and leena gems on Instagram (looks like the individual is a seller/manager of leena gems). FB links don't usually work, but their instagram is @leenagemslk. Arkteia and lovedogs like this. I have bought quite a few stones from this seller. I've been very happy with the results. Stone Hunter and lovedogs like this. Someone needs to buy this as a set and not separate those sapphires! Too bad I don’t wear earrings. chrono, IslandBB, 2Neezers and 1 other person like this. I AM DEAD! NEED THESE BUT WALLET SAYS NO. Plz someone else buy them. Sunstorm, MrsKMB and 2Neezers like this. This one is a beauty ! This 3.5ct Merelani mint garnet is freaking gorgeous! It’s a concave cut, which I love and it was cut by Gene at Precision Gem so you know the cutting is top notch. LisaRN, suzanne2, AceofHearts and 2 others like this. JmeeMrie, Tekate, Mrs_Strizzle and 2 others like this. The color play on this is so cool! Sunstorm and Arcadian like this. Keeliamira, Arkteia, Tekate and 9 others like this. Check out this 4ct yellow sapphire on LT. 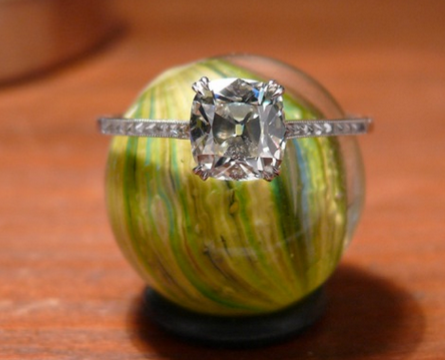 It has .30ct diamonds on each side and it's only $1,000! Keeliamira, junebug17, Arcadian and 6 others like this. lovedogs, kindred and elle_71125 like this. I’m looking to buy the yellow sapphire ring. I’ve never bought from loupe troop before. Is there anything glaring about the ring I should ask about. Is the gem report with the ring legit? Thanks! Saw this in Gary's latest maildrop, and I hope it will go to a good home! Wish I had the money to spare as the colour pops at me! MissyBeaucoup, Tekate, leslie1956 and 7 others like this. it's a grossular garnet, and the inclusions are like fireworks!!!! For those who don't have IG, I took a few screenshots of the video. kgizo, MissyBeaucoup, voce and 1 other person like this. I love the ice blue color!! I have a milestone birthday coming up and I've decided I'm getting myself something sparkly. As my gift to me. I have been scouring LT and the preloved section for something that speaks to me. This aquamarine is SINGING to me. I've asked about it. Cross your fingers for me!! Hivona, Arkteia, Bluegemz and 2 others like this. Is this vintage better price than the new opal? TheGarnetGirl, ChaiK, AceofHearts and 15 others like this. voce, familynurse, Arcadian and 1 other person like this. Perfection. Right there. The colour is out of this world and that is my favourite cut by far. Oh, yay! I'm happy for you and can't wait to see what you have planned for this beauty! junebug17, MrsKMB and elle_71125 like this.